Monday, I stayed home and took Nora to the doctor. She has pink eye. As all working parents know, kids with pink-eye have to be on antibiotic drops for 24 hours before they can go back to daycare. So, Tuesday morning, I sent my boss an email that I would be in around noon. Then I hit a wall. The thought of going in to work made me want to cry. I tried thinking up a way to stay home all day. I wanted to lay in bed and vegetate. Whenever I feel this way, I immediately ask myself what it is I’m trying to avoid — then I force myself to do it. Vegetation leads to depression. Unless you are a vegetable, then it leads to a salad. Or maybe a gratin. I psyched myself up, “I’ll clean the house so I won’t come home to a pit, then I’ll go to work, get a ton of stuff done, and come home to a clean house. And I’ll make hamburgers for dinner. It’ll be great.” I had Nora help me pick up the Duplos, vacuum and load the dishwasher. Here’s the part where you expect me to say that something fantastic happened as a result of pushing through my slothful inclination. I had a super productive day and felt great about myself for modeling responsible behavior for my daughter, right? Wrong. My boss made snide comments about me being out with a sick kid and a bunch of people brought me a bunch of new problems. I didn’t clear even one item off my worklist. Am I sorry I went in? No. If I’d curled up in the fetal position and stayed home, I’d only be inviting melancholy and postponing the inevitable. There would be more snide comments and more backlog to go back to. And therefore more stress and more desire to withdraw. Good choices don’t always yield happy results, but bad choices never do. That’s the unglamourous truth it took me thirty years to discover. Meh. 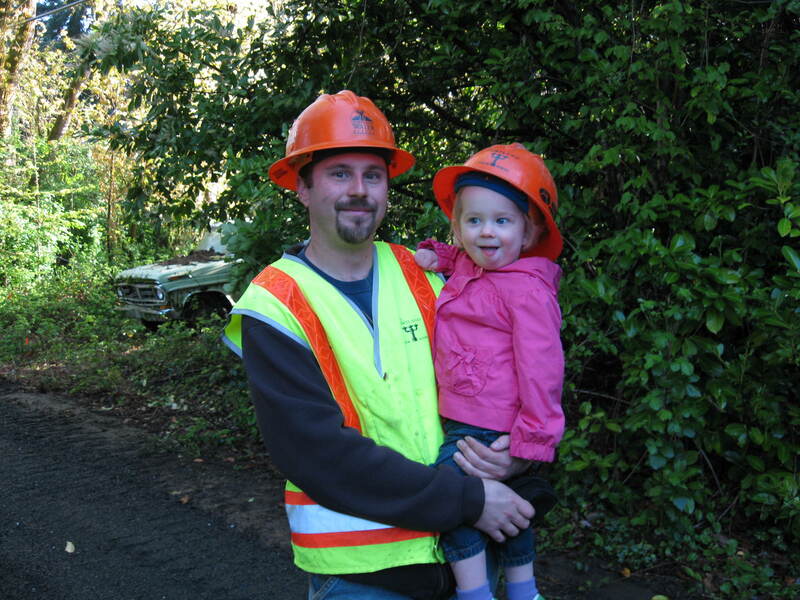 Ben brought Nora onto one of his job sites last week for an informal “Bring Your Child to Work” Day. 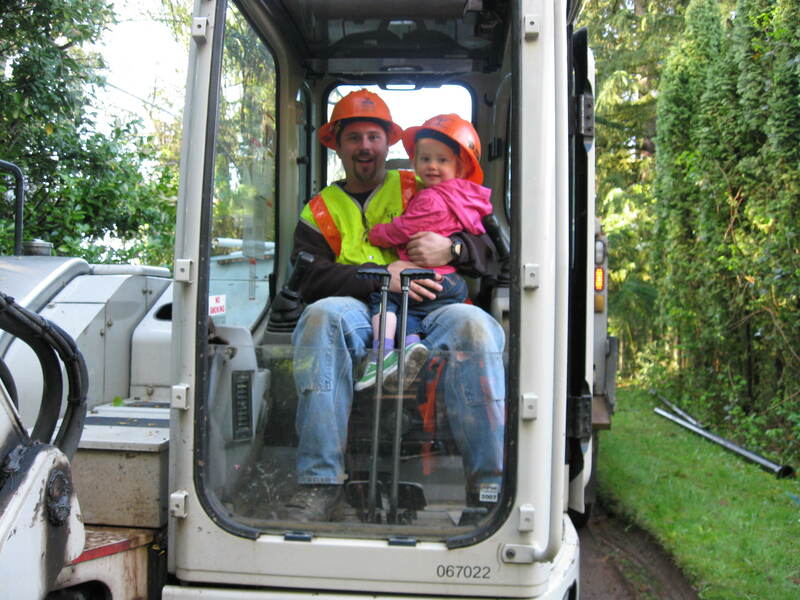 She got to sit in a dump truck and a backhoe. And best of all, she jumped in a four-inch deep mud puddle. How am I supposed to follow this? “Look Nora! A desk! And another desk! And a computer!” Sheesh. I’m going to have to stock my desk with chocolate. Someday scientists are going to find the “pink gene” on the X chromosome. Studies will be launched to find out why the effects of this gene wear off after puberty. In the meantime, I have to bite my tongue about pink. Educated by the liberal elite in the Minnesota public school system, my dislike of pink evolved around the same time I learned about the glass ceiling and read The Feminine Mystique. In high school, I dressed in brown and green. I scorned a jock I’d known since first grade when he told me I’d be pretty if I wore a bit of lipstick. I concluded that pink was for the unenlightened teenage girl bent on nothing more than a beautician’s certificate. Back in the good old days, when Nora was oblivious to clothing, I generally avoided buying anything pink. I dressed her in lots of green (my favorite color) and earth tones. While still pregnant, I went shopping at the Children’s Place and bought one pink onesy and one blue onesy. The clerk asked me if I was having boy/girl twins. I rolled my eyes in disgust (and ran home to ask my husband if I looked big enough to be pregnant with twins!). Nora is now a person with solid preferences. She likes pink and purple. She knows green is my favorite color and orange is Daddy and Nana’s favorite color. She respects our choices. I have to respect hers. I don’t disparage pink in front of her as I’m not a big fan of quashing childhood enthusiasm. 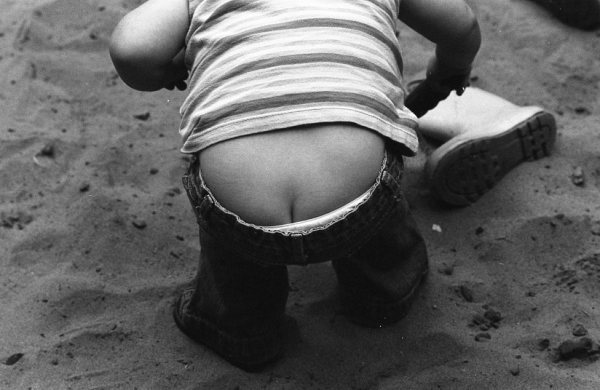 People who try to instill adult cynicism in kids are on my “You’re a Puke” list right below guys with truck nuts and obscene bumper stickers. Childhood is about imagination and exploration. Cynicism comes later (if it must). And my dislike of pink is pure cynicism. I’m trying to make peace with pink and even have a few pink shirts of my own now. I realized Nora looks really great in pink, and since she is my clone, maybe I would, too. I also try to bite my tongue about mismatched outfits. Most of the time, I find them quite charming. I especially like when Nora wears dress with a skirt over the top of it. Sometimes, like when we’re going to the doctor’s office, I’d prefer she didn’t look like a ragamuffin (to use my mother’s word). So, I try to talk her into wearing the orange striped tights with her orange dress, instead of the tights with the pink and purple flowers. Then I hear myself caring about something that should be nothing and I let it go. Anyone who knows anything will know she dressed herself, especially when they look at monochromatic me. And truly, striving to exert control over clothing choices drives a tiny little wedge and sends a message that what your child likes is wrong, “You shouldn’t like what you like, you should like what I like.” I never want to be that mom. This is the routine when Nora tells me she has to go potty: We walk quickly (no running, it freaks her out) to the bathroom. I pull down her pants and lift her onto the big toilet. (She finds potty chairs insulting.) I sit across from her on a little stool Ben and Nora built together. She pees. If she poops, it can take awhile (she eats loads of fiber). It is the perfect time for bonding. Light streams in through the bathroom window and her big blue eyes practically glow. We talk about things: chickens, her friend Otto from school, what seeds we’d like to plant in the garden. Sometimes we sit forehead to forehead, smooching. Then I hear a plop sound. “Is it time to wipe?” I ask. “I’m still pooping,” she says, brow furrowed. So we talk some more. Sometimes I get a little teary. She’s so beautiful. So fun to talk to. At daycare, she goes to the bathroom, pulls down her pants, sits on the toilet, wipes, flushes and washes her hands with little to no assistance. When I try to get her to do this at home, she say, “I want you to do it.” I think she likes the bathroom bonding time as much as I do. But I am glad it’s warming up outside, so I can crack the window. The other day, Ben was walking around dowtown with Nora, waiting for me to get off work. She was hungry, so he started looking around for a place to eat. He told her he might take her to a restaurant. Time got away from him, and he didn’t find a suitable restaurant before it was time to meet me. When I got in the car, Nora was talking about going to a “real restaurant.” She wanted to go right now. We talked her down and made a plan to go out for breakfast on Saturday morning. I realized Nora had never been to a “real” restaurant. We rarely dine out. She’s been inside Burgerville once. And she’s been to a buffet a few times when her grandparents are in town. But I can’t remember ever taking her to a restaurant where they seat you, give you a menu, take your order and bring your food. We have been severely remiss. She’s almost three for pity’s sake. So, this morning, we took her to a little family restaurant. We sat at a table. The server gave her a booster seat and a kid’s menu. She ordered a pancake and egg plate. The pancake was bigger than my head and had Mickey Mouse ears. She was delighted. (Wait until someday she realizes the existence of maple syrup!) She behaved perfectly. We’re going to make it a monthly event.